The N.E.R. E1 Class of locomotive is a remarkable design being unique in that it was constructed over a period of 54 years, by 3 different railway companies. Designed by Wilson Worsdell for the N.E.R. and introduced in December 1898, the first 20 engines were built at North Road Works, Darlington by 1899. 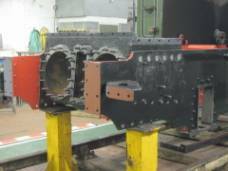 Sir Vincent Raven, who succeeded Worsdell, had 20 more built in 1914 with very slight modifications to the original design, then a further 10 were built in 1920 and another 25 by Armstrong Whitworth at Newcastle in 1922/3. 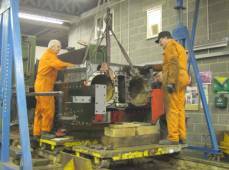 Sir Nigel Gresley for the newly formed L.N.E.R. 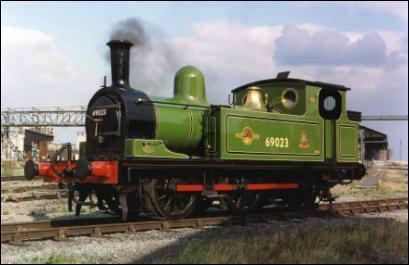 re-classed the engines as J72’s and then built 10 at Doncaster in 1925. 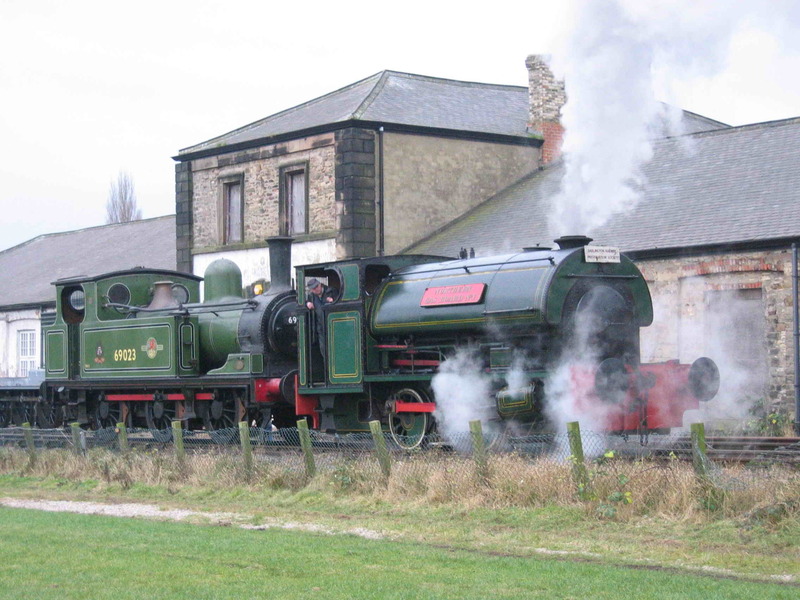 And then remarkably 54 years after they were first introduced British Railways built a further batch at Darlington, 20 in 1949 and 8 in 1951, bringing the class total to 113. 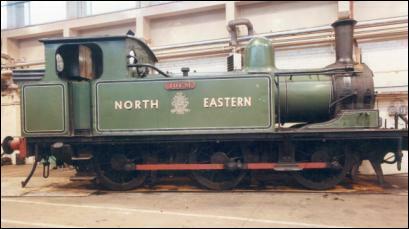 Class E1 No 2173 built at Darlington in 1914. 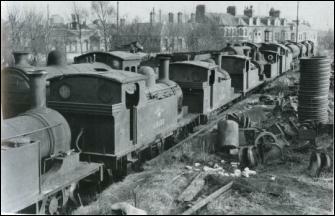 These 0-6-0T's were used in shunting yards, railway owned docks and coal staithes and on station pilot workings all over the Northeast. 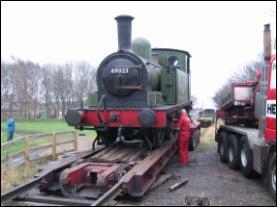 Eventually they were found further afield at Wrexham, Kittybrewster at Aberdeen, Keith and Kipps. The last batch were almost identical to the original but were given a vacuum brake, steam heating and sanding gear to enable them to be used on empty passenger stock workings, in addition, some of the earlier engines were similarly modified. The N.E.R. and L.N.E.R. 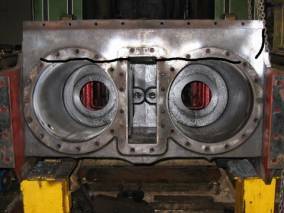 built engines became under B.R. No's 68670 to 68754 and as no provision had been made for further construction the last batch had to be numbered in a special series and came out as No's 69001 to 69028. All 113 remained in service until 1958, when following the introduction of diesel shunters some of the earlier engines began to be withdrawn from traffic. In 1961 J72’s waiting to be scrapped on what is now the field between this workshop and the museum. By 1964 and all but two of the class had been scrapped, mostly at Darlington North Road or at T.J. Thomson Ltd. of Stockton-on-Tees. The two exceptions were 69005 and 69023, which were taken into Departmental Stock as No. 58 and No. 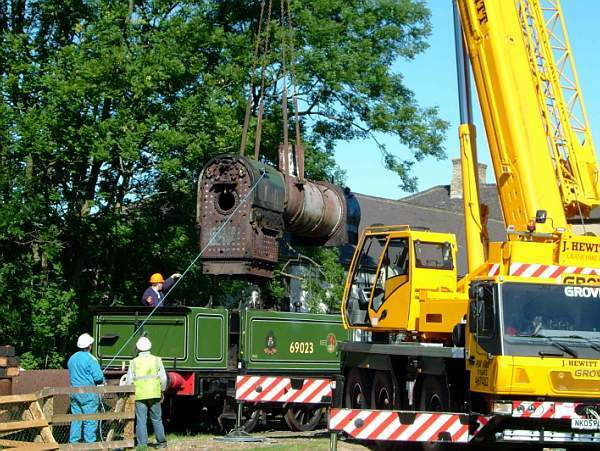 59 initially at Gateshead but latterly at North Blyth and Heaton, where they were used for de-icing. 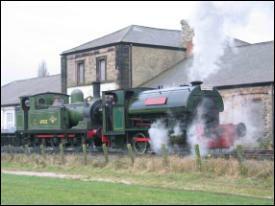 Both withdrawn near the end of steam in the Northeast, No. 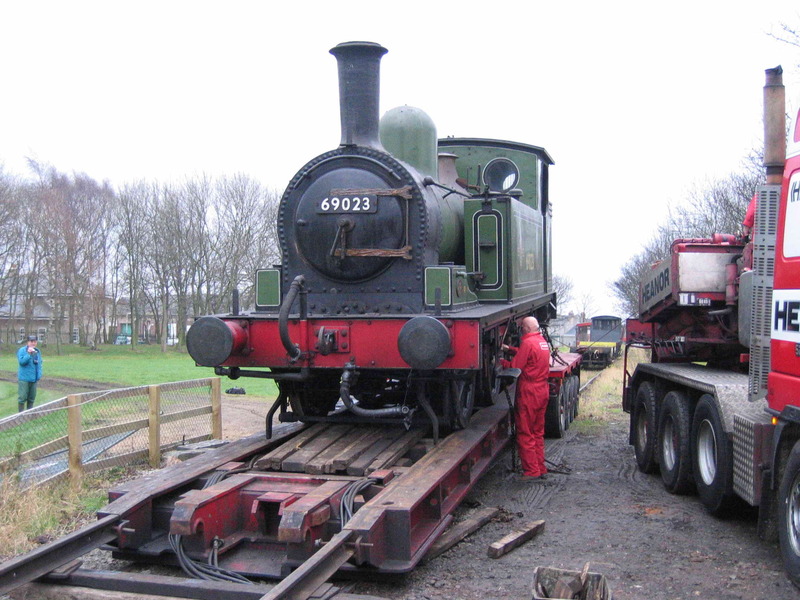 69005 was scrapped but 69023 became the only survivor when it was purchased by Mr. R. Ainsworth for preservation. 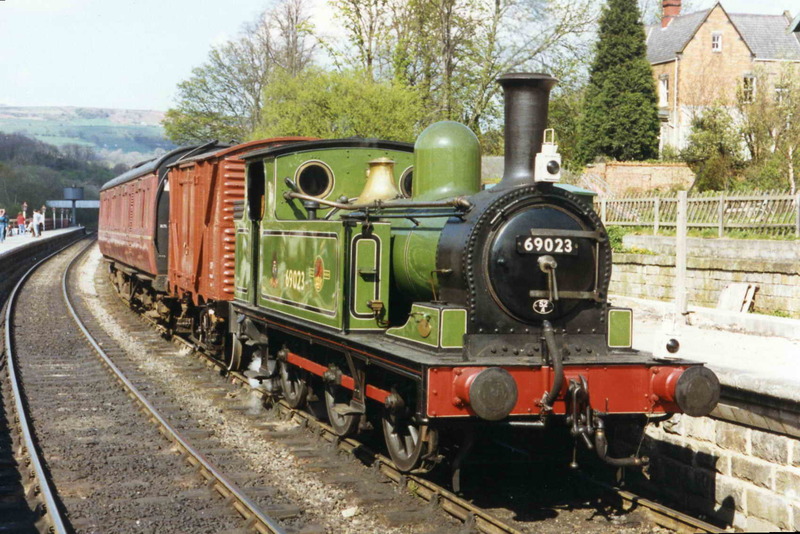 69023 was delivered to the Keighley and Worth Valley Railway in 1969 where it was restored with its original number, in N.E.R. livery and named 'Joem', this being taken from the names of his father Joseph, 50 years service with the L.N.W.R., and his mother Emmeline. 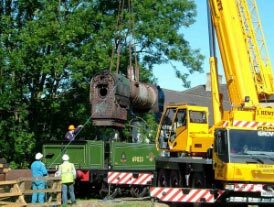 Later 'Joem' saw service on the Derwent Valley Railway at York but following the death of its owner the locomotive was put into store at the National Railway Museum, awaiting disposal. 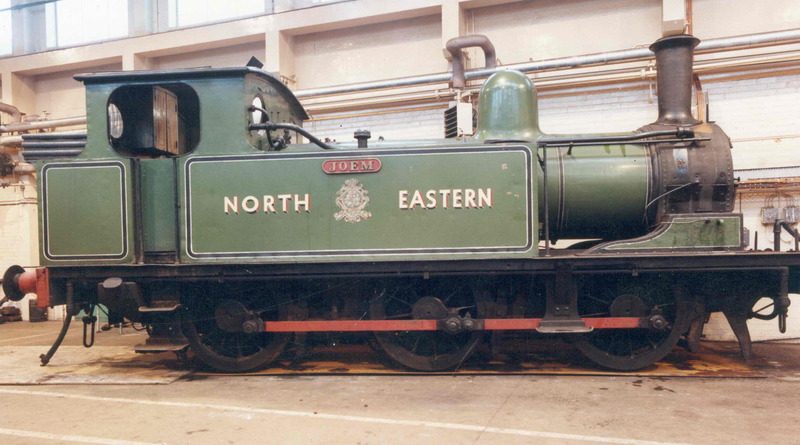 69023 was then purchased by the N.E.L.P.G. 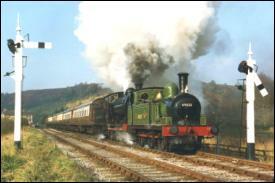 and delivered to Grosmont in January 1983, remaining in traffic until late 1985 before undergoing overhaul at I.C.I. 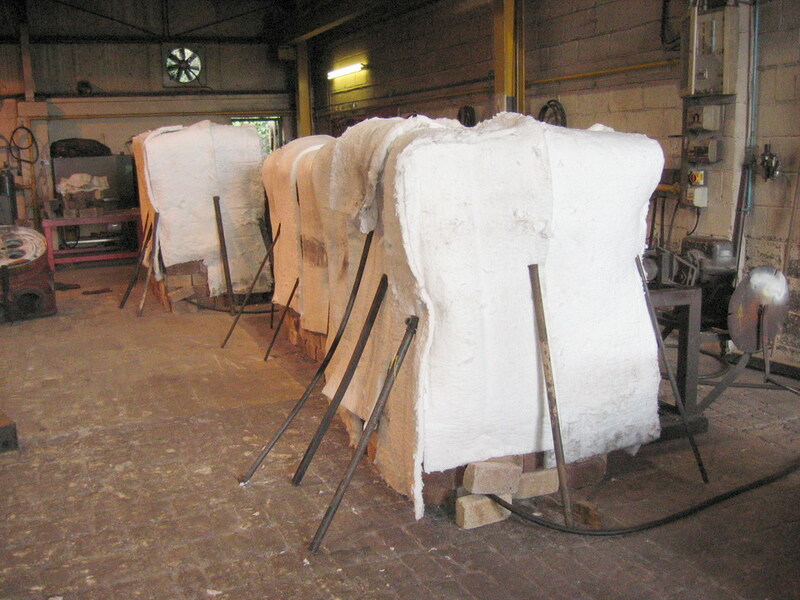 Wilton. At the same time a repaint in N.E.R./BR pattern lined green was undertaken, this style of livery was inspired by British Railways action in repainting two J72's No’s 68723 and 68736, for use on station pilot duties at Newcastle and York in N.E.R. green in the early 1960's. Following restoration at ICI Wilton 69023 returned to the N.Y.M.R. 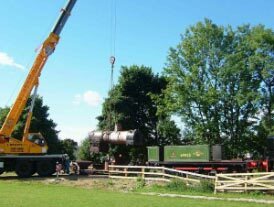 where it regularly hauled lightweight trains as well as its more usual role of station pilot at Grosmont. Being small and easily transportable by road 69023 also visited many other railways, including the North Norfolk, Yorkshire Dales, South Devon Steam, East Somerset, Swanage, Bo'ness and Kinneil Railway, the Great Western Society at Didcot and it also attend open days at Hartlepool Power Station and BR’s Thornaby depot. 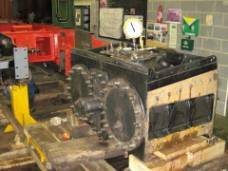 In 1996 69023’s 10 year boiler ticket expired the engine was then stored on display inside NELPG’s Deviation shed at Grosmont on the NYMR. 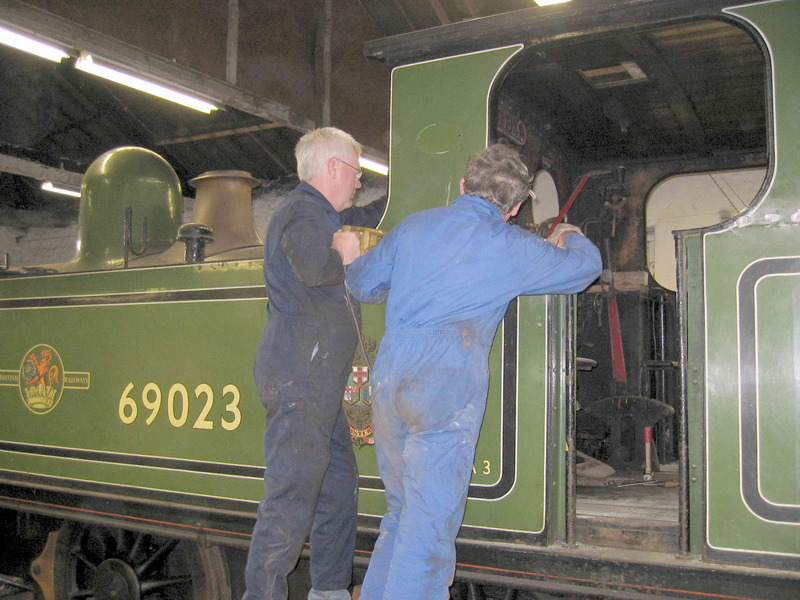 The engine eventually worked its way to the front of NELPG’s restoration queue and in 2004 the engine was moved from Grosmont to the workshop here at Darlington. 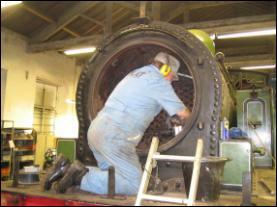 Work started on the overhaul of the locomotive in May 2005 and we hope to have the engine complete and running again within 3 years. 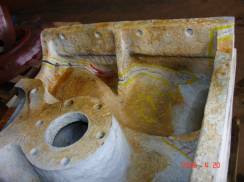 The biggest single repair of the overhaul other than the boiler overhaul was the repair of the cylinder casting. 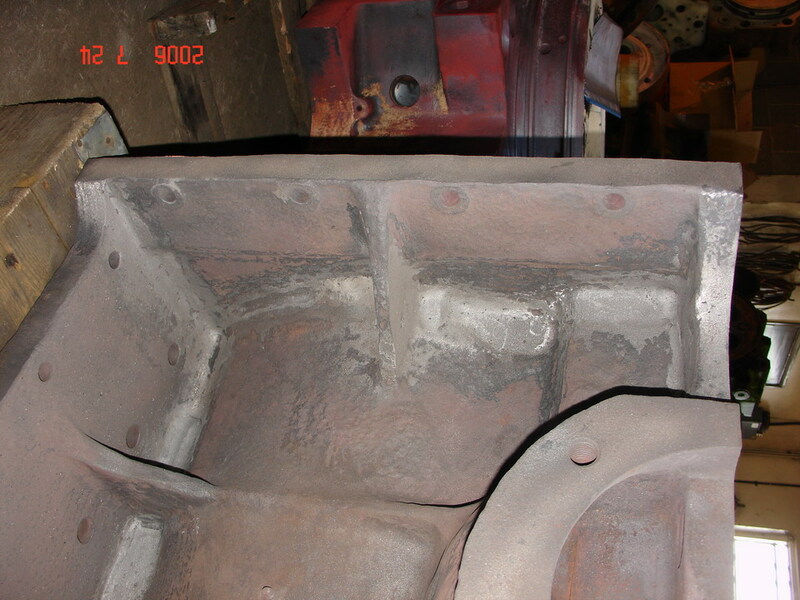 During the last few years of running before the overhaul cracks appeared across the top front face of the steam chest. 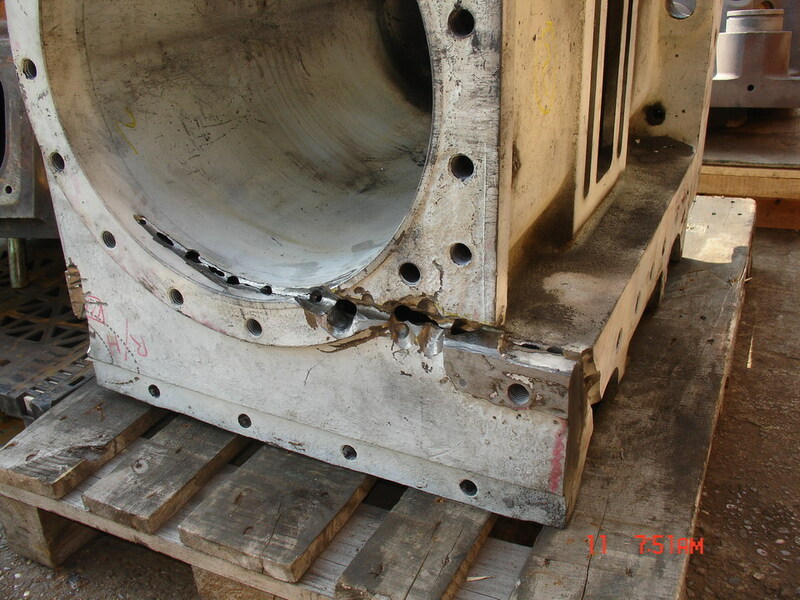 Repairs at that time had been undertaken using a method called metal stitching but after dismantling the block during the overhaul it was clear that the fractures where far beyond what could be repaired using the metal stitching and another method of repair would be needed. The above picture shows the extent of the fractures as they run from the top of the steam chest out across the tops of both cylinders, they don’t only go into the cylinder but run back up through the casting and into the smokebox area. 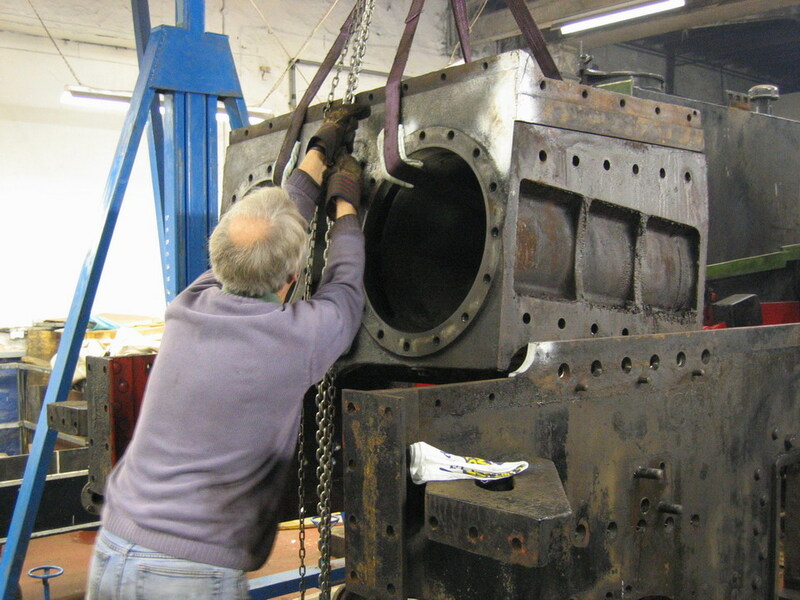 To allow access to the block and the fracture it was necessary to remove the block from the frames and split it into its 2 parts as joined along the centre of the steam chest. 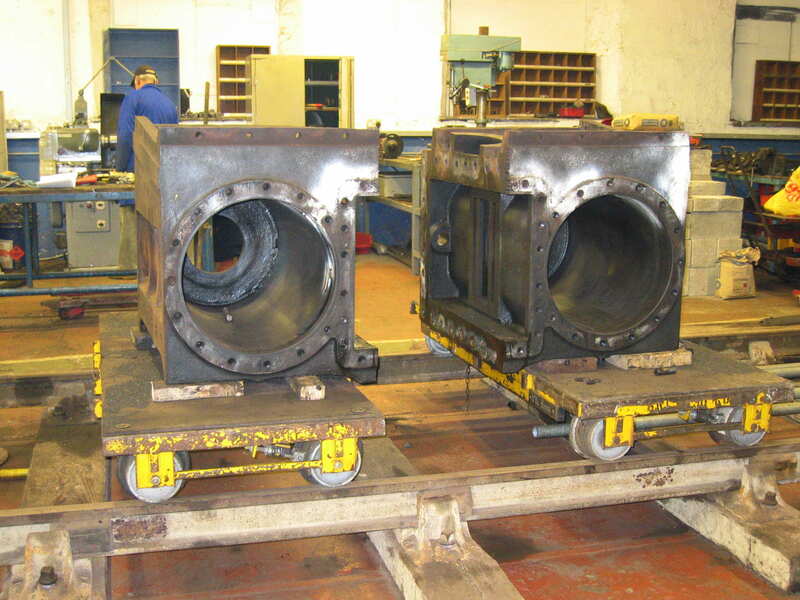 The above left picture shows the block been lifted from the frames, centre shows the block having the fitted bolts removed from the centre flange to allow the 2 half’s of the block to be split and right shows the 2 parts of the block after splitting. 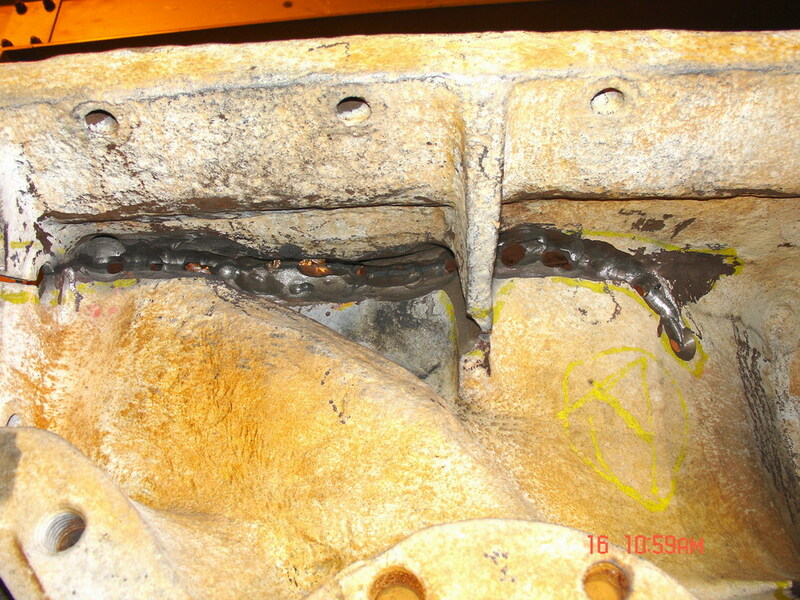 The extent of the fractures can been in the 2 photographs below. 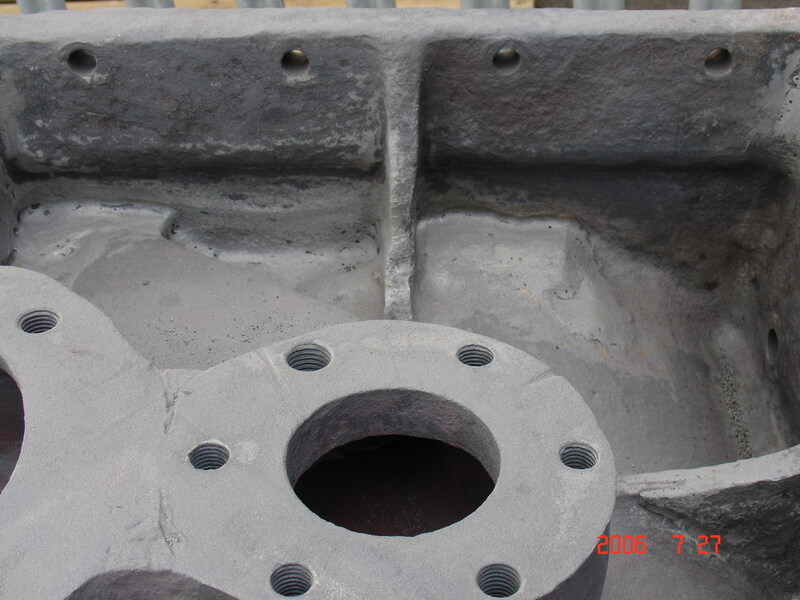 Following examination by several different specialist casting repair companies the decision was made to send the 2 parts of the block to Cast Iron Welding Limited at Coalville, they repaired the block using a gas fusion welding technique. 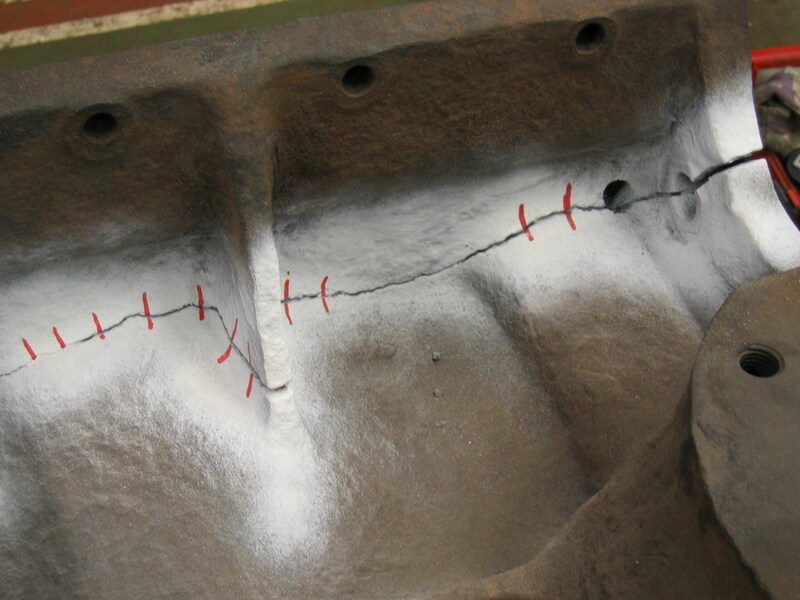 The 3 photographs below show the detail of the weld preparations as material is ground out to access the route of the fractures to enable a complete repair. 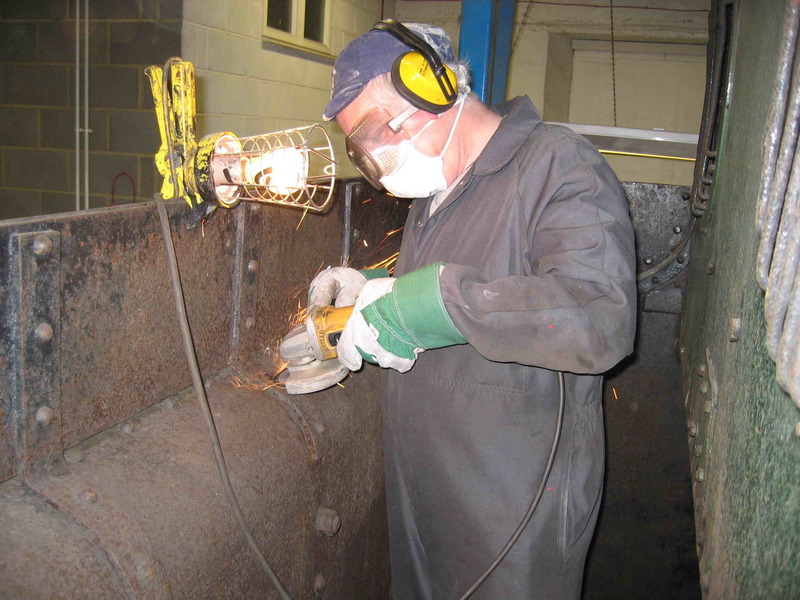 They then constructed an oven around the blocks, this is to enable pre-heating of up to 600’C for 24 hours before the fusion welding can begin. The finished results can be seen below, compare these photos with the 2 photos above that show the extent of the fractures. On completion of welding all the joint sealing surfaces on the blocks where machined before the blocks returned to our Hopetown workshop for assembly. 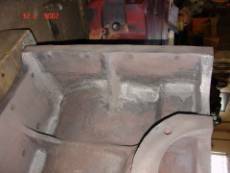 The blocks where then placed end on end and the fitted bolt holes for the bolts that hold the 2 half’s together where reamed before fitting with new fitted bolts as shown in the picture below left. With the block back in one piece the cylinder covers and valve covers where fitted and the block filled with water before it was hydraulically pressure tested as seen in the picture above right. 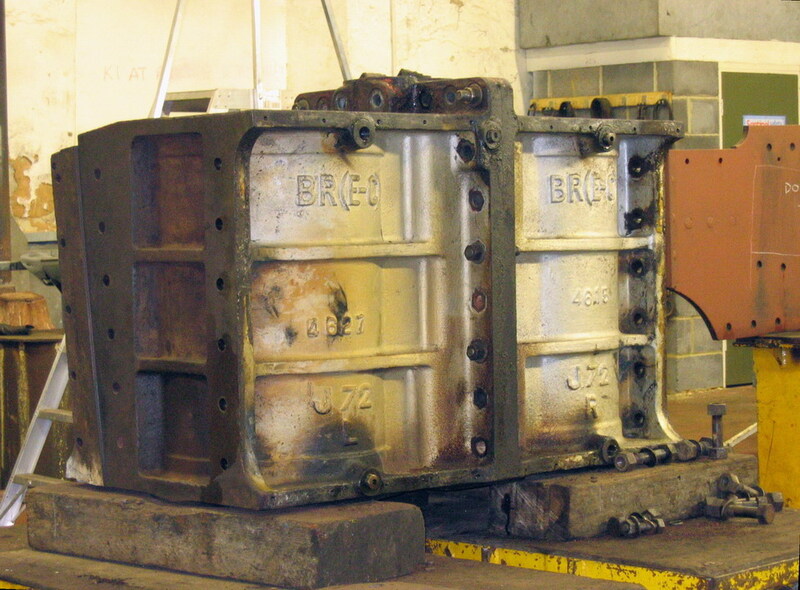 Following a successful hydraulic test the block was refitted in the frames as seen above left, and then secured with all new fitted bolts as seen in the picture above right. 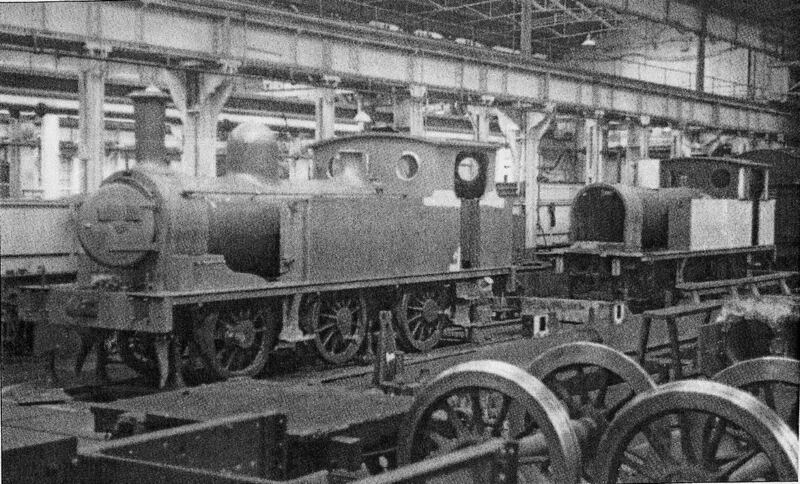 The picture below shows 69023 under construction in North Road Works at Darlington in 1951, 54 years after the first member of the class was built. 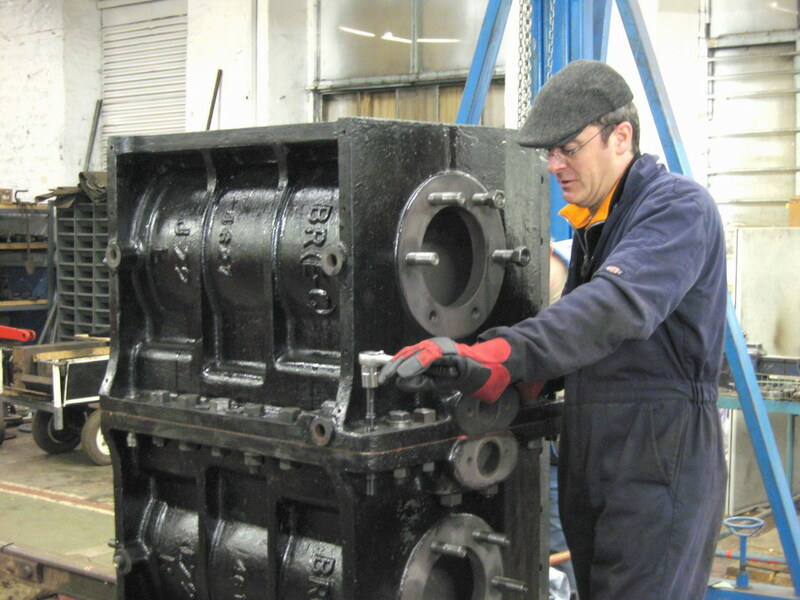 Now 54 years later 69023 is back in a workshop in Darlington undergoing restoration to its former glory. 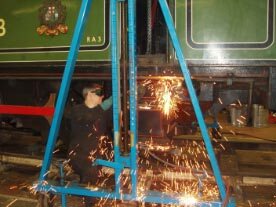 An article about the J72 by Maurice Burns and published in Heritage Railway describing the background associatd with the purchase, preservation and eventual aquisitionby NELPG can be found by following the link. Darlington Works number 2151. To traffic 17/4/51. Condemned 18/9/66 sold for preservation.